All is back to normal for Salesforce.com (NYSE:CRM). CRM stock had been one of large-cap tech’s best performers through the summer, rising over 250% in a little over five years. Salesforce stock then took a tumble, at one point losing 30% of its value. But CRM has recovered, touching a new all-time high earlier this month. Heading into Q4 earnings on the afternoon of March 4, the long-term upward trend appears re-established. And as a blowout fiscal Q3 report in November showed, the volatility in Salesforce stock had little to do with the steady and impressive performance of the underlying business. The rebound in the stock, then, makes some sense. But it puts CRM stock back into a familiar position. I wrote back in July that the story of CRM stock – great business, questionable valuation – echoed those of so many other tech high-flyers. That’s again true, and it sets up an intriguing report on Monday for not just Salesforce stock, but the entire tech space. For two reasons, it seems exceedingly likely that Salesforce will beat expectations on Monday. First, history strongly suggests such an outcome: Salesforce hasn’t missed consensus on either revenue or earnings in at least five years. In each of the last eleven quarters, Salesforce earnings and revenue have come in ahead of the Street. Second, expectations don’t look particularly high. Consensus essentially matches the company’s guidance given after Q3. Salesforce traditionally outperforms its guidance, another reason to expect a beat. And the 24.9% revenue growth forecast by analysts is actually toward the bottom range of recent performance, while the Mulesoft acquisition should provide some help as well. All told, a miss likely would lead CRM stock to fall, if not plunge but that outcome seems unlikely. That said, investors will be watching fiscal 2020 guidance as well. Salesforce gave revenue guidance after Q3, projecting 20-21% growth. With Salesforce stock at all-time highs, investors likely are hoping, if not expecting, that figure will be raised. The Street already is at the high end of the range. Earnings guidance should be delivered with the Q4 report. Current consensus on that front suggests just over 5% growth – a seemingly conservative figure. So there’s a clear path here for Salesforce to deliver another beat-and-raise quarter, the type of report that sent Salesforce stock soaring after the Q3 release. Expectations are reasonable. Competition from Microsoft (NASDAQ:MSFT) and Adobe (NASDAQ:ADBE) has shown little sign of slowing Salesforce.com down. Of course, there’s one major difference: CRM stock is at the highs, not near the lows. The question is if even another strong quarter and boosted guidance is priced in. Of course, that’s the same question that has dogged CRM stock for years now, and yet last year’s quick decline aside, the stock has kept moving higher. There are some reasons for concern. Initial FY20 guidance does suggest a long-awaited deceleration in growth. CRM stock trades at over 50x FY20 EPS. Even backing out cash, and even ignoring heavy share-based compensation, that accounts for about half of those adjusted profits. Analysts are heavily behind the stock, but CRM stock once again is nearing even bullish outlooks. The average Street price target of $174 suggests just 7% gains. Meanwhile, CRM is back at 2018 highs and many software peers have done even better. Workday (NASDAQ:WDAY) has gained more than 50% from November lows and trades at an all-time high. Splunk (NASDAQ:SPLK) has done roughly the same. For enterprise software plays, investors are even more bullish than they were in September. That sentiment seems potentially worrisome and it again raises the question of just how much upside possibly can be left. Salesforce stock has quadrupled in less than six years. Backing out share-based compensation, it trades at something like 100x next year’s earnings. We saw just five months ago what happens to a stock like that when that bullish sentiment reverses. With share prices back at the highs, old concerns have resurfaced for CRM and for its peers. And so the reaction to Salesforce earnings next week should be watched by all investors. Is a beat-and-raise quarter greeted with enthusiasm or a shrug? As I wrote back in July, at some point valuation has to matter. And it did – for a couple of months. Those concerns again are being brushed off. Monday’s report should show whether that will continue to be the case. 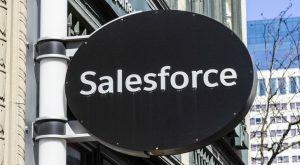 Article printed from InvestorPlace Media, https://investorplace.com/2019/02/earnings-bring-salesforce-stock-crm-stock-valuation/.